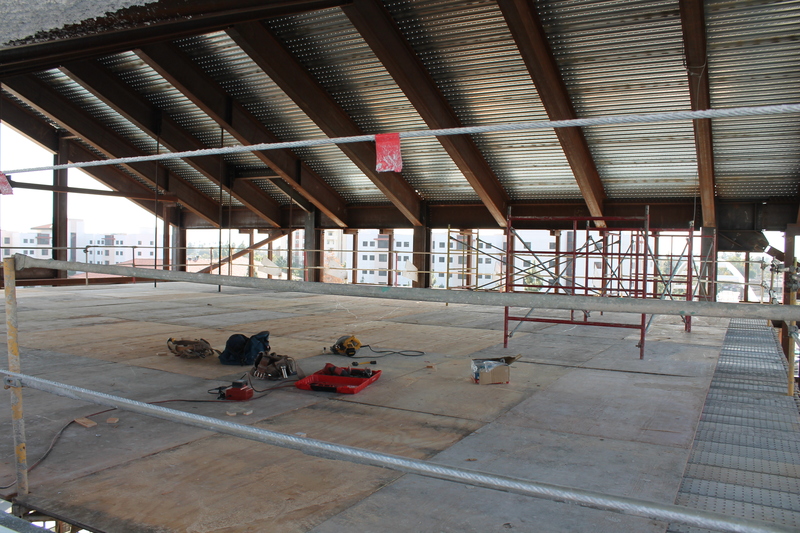 While Aztec Student Union still has months of construction to go before completion, it already has a dance floor. But, this is no place for future Fred Astaires or Ginger Rogerses. No, it’s a very secure piece of scaffolding that is so well-engineered, it could be danced upon by crew members. 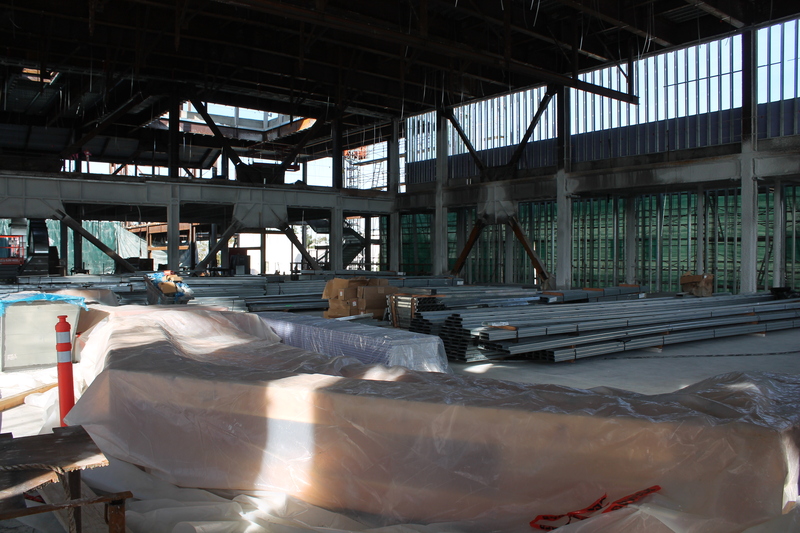 Behold, the dance floor above the 300-seat theater. So, why does the crew need access to the ceiling of the theater? Well, the answer lies beneath the plastic sheeting in the foreground of the below photo. 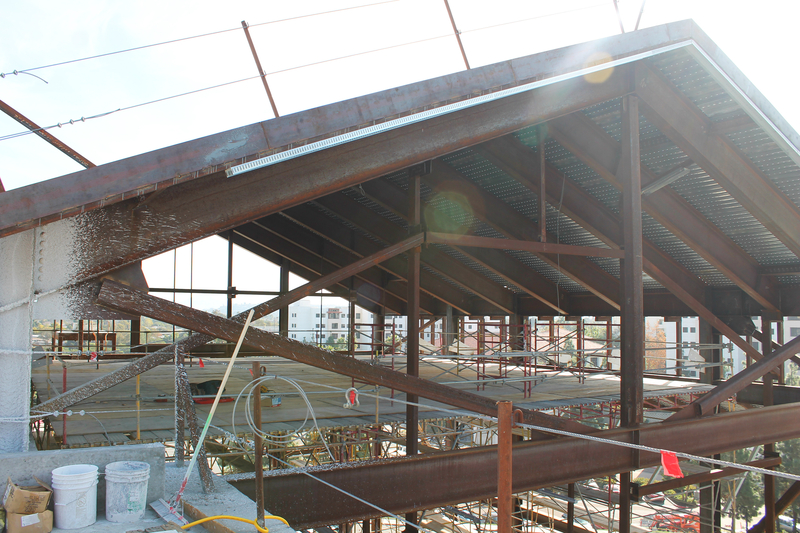 Wood trusses will eventually be installed in both the theater and Montezuma Hall. In order to install these exposed wood beams (see Hardy Tower, room 140, for a bit of architectural influence), the crew needs to access the highest points of the room and they need the so-called “dance floor” to be stable enough to hold not only them and their equipment, but the very heavy wood trusses, too. And considering how tall the theater is — it has entrances/exits on both the second floor and the third floor of Aztec Student Union — the dance floor’s stability is a high priority (pun intended)! Looking forward to dancing the night away in Aztec Student Union? Stay up to date and “like” it on Facebook, follow it on Twitter or visit the website. This entry was posted in Construction and tagged architecture, theater. Bookmark the permalink. 1 Response to Let’s Dance!